St. Paul, Minn., June 9, 2017 – PolyMet Mining Corp (“PolyMet” or the “Company”) TSX: POM; NYSE MKT: PLM – today reported that it has filed its financial results for the three months ended April 30, 2017. PolyMet controls 100 percent of the development-stage NorthMet copper-nickel-precious metals ore-body and the nearby Erie Plant, located near Hoyt Lakes in the established mining district of the Mesabi Iron Range in northeastern Minnesota. On March 3, 2016, the state determined that the Final Environmental Impact Statement addresses the objectives defined in the EIS scoping review, meets procedural requirements and responds appropriately to public comments. The 30-day period allowed by law to challenge the state’s decision passed without any legal challenge being filed. The Final EIS demonstrates that the NorthMet Project can be constructed and operated in compliance with environmental and human health standards. In October 2016, the Company closed, in two tranches, a private placement of 40,074,418 units for gross proceeds of $30.055 million which included pro rata participation by Glencore. On January 9, 2017, the USFS issued its Final Record of Decision authorizing the land exchange. Loss for the three months ended April 30, 2017, was $3.225 million compared with $2.352 million for the prior year period. 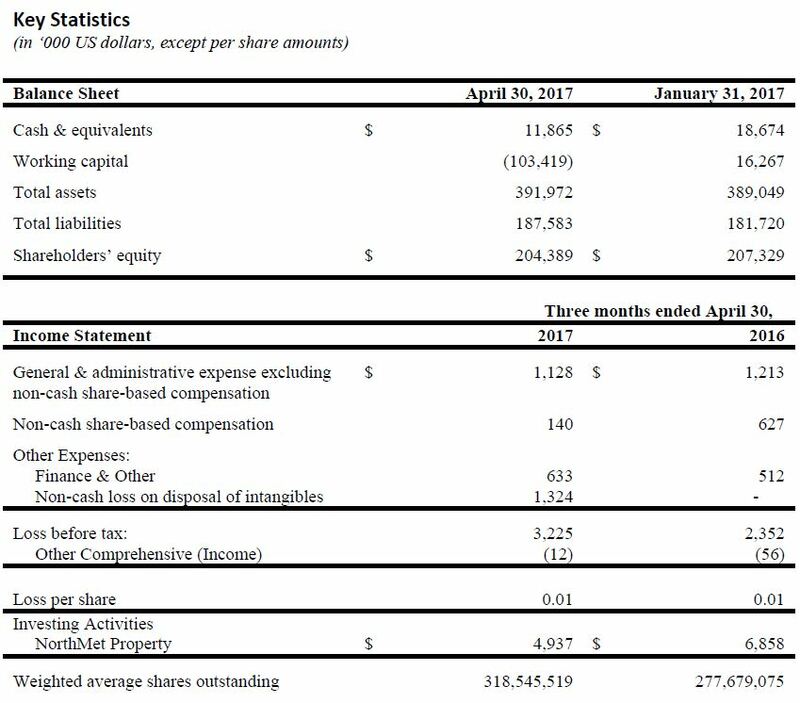 General and administrative expenses for the three months ended April 30, 2017, excluding non-cash share-based compensation, were $1.128 million compared with $1.213 million for the prior year period. Other expenses were $1.957 million, including a one-time non-cash loss of $1.324 million on the disposal of wetland credit intangibles, compared with $0.512 million for the prior year period. At April 30, 2017, PolyMet had cash of $11.865 million compared with $18.674 million at January 31, 2017. The Company is in discussion with Glencore regarding the convertible and non-convertible senior secured debentures currently due to be repaid upon the earlier of availability of construction finance or March 31, 2018. PolyMet invested $4.937 million cash into its NorthMet Project during the three months ended April 30, 2017, compared with $6.868 million in the prior year period. As of April 30, 2017, PolyMet had spent $121.547 million on environmental review and permitting, of which $115.096 million has been spent since the NorthMet Project moved from exploration to development stage.